I'm looking forward more to the Belle and Sebastian compilation. Maybe I should give B&S another try. I've heard Boy with the Arab Strap (I think that's the title) and If You're Feeling Sinister once each, but they never registered with me. Well don't pull a Cobbler and start with this new one, it's a collection of recent b-sides. Shearwater covers album, Fellow Travelers, will be released Nov. 26th on Sub Pop. Man, I wanted to spring for the Loser Edition of that Shearwater covers album, but I'm not about to spend $7.50 on shipping and handling for a $14 record. I'm still embarrassingly behind on this dude, but hot damn, "Grown Up" is one of the best hip-hop tracks of recent times. It's tempting. I kind of want the bonus 7" and at least with Paracosm the bonus single came with a download code. Putting this out a day early because football. Let me know if anything needs to be added. Anna Calvi's new album, One Breath, will be out on October 8th. 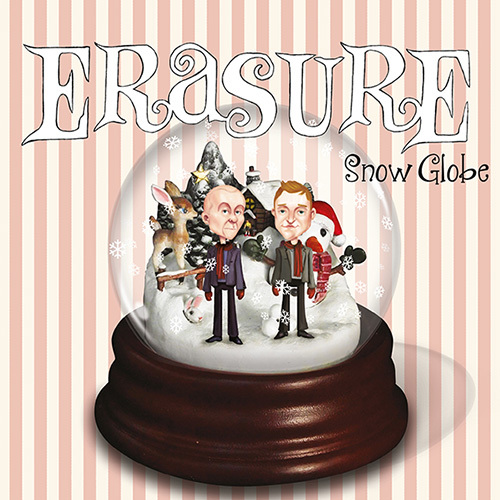 It is entirely appropriate that - as we've been counting down to today's Erasure announcement - I have been feeling like a kid waiting for Christmas. It really has been that exciting, waiting to be able to share the first official news of the brand new Erasure album with you all! If you've been on the Erasure website this week you will have noticed that it has taken on a whole new colour-scheme to fit the new album release, and here's the very first peep at the album cover those colours and elements have been taken from. I love it and I hope you all do too! I know that many of you will also be anxious for news of the next Erasure tour and, although there won't be a tour around the actual release of this album, the good news is that the band are looking at all sorts of opportunities for next year, so keep your fingers crossed that they'll be somewhere near you very soon!